Sketches, research, German translations and publication permissions courtesy of Stefanie Walzinger. Video clips and screen shots, courtesy of Vince Di Placido. Costume sketches published with permission from the Alfred Bücken Estate housed in the Deutsches Filminstitut (DIF) with special thanks to Beate Dannhorn, responsible for Nachlässe und Sammlungen (Estates and Collections) at DIF, who provided files for publication. 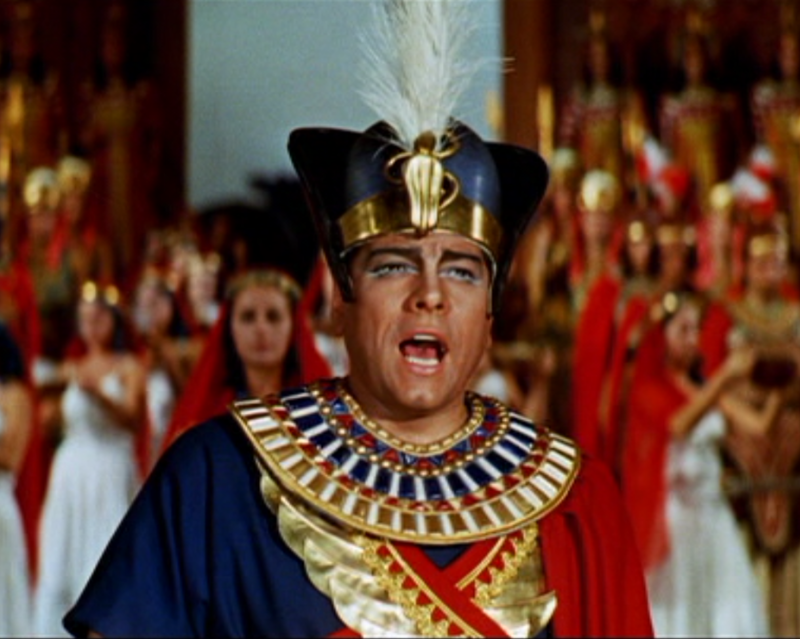 Mario Lanza's last film, For the First Time (Corona Films and MGM; released 1959; Grammy nomination, November 1959, Best Soundtrack Album, Original Cast Motion Picture or Television) included lavish operatic scenes staged with the music of the Rome Opera House Orchestra. Veteran designers Alfred (1910 - ?) and Sophie Bücken (1913 - ?) 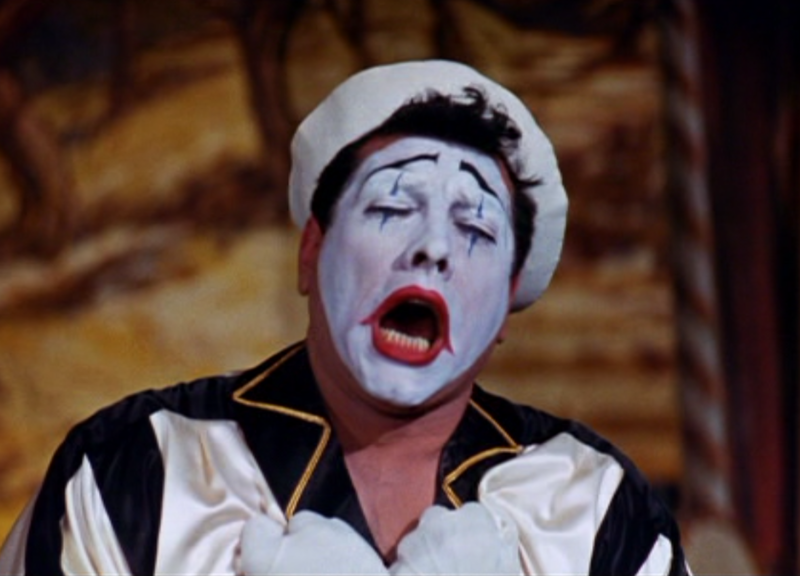 created Mario Lanza's elaborate costumes for selections from Pagliacci, Così fan tutte, Otello, and Aida. [links jump to sketches below]. 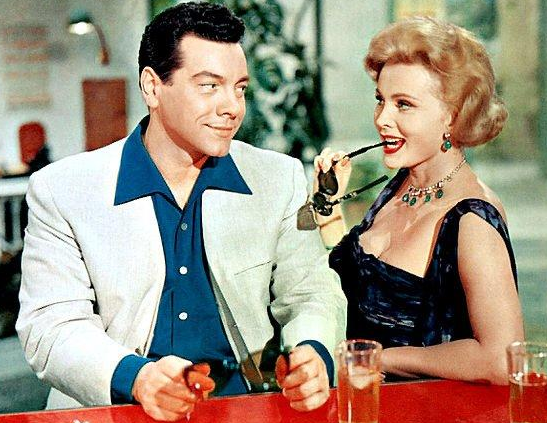 A stage designer, fashion illustrator, and painter, Alfred Bücken costumed over 30 films, frequently teaming with his wife and in association with German studios including UFA, Deka-Film GmbH, Tobis-Filmkunst GmbH, Bavaria-Filmkunst GmbH and Corona. His fashion sketches appeared in Constanze, a leading German women's magazine between 1948 and 1961. Later, he taught painting in Wiesbaden. Just as it was for Lanza, For the First Time became Bücken's last film. 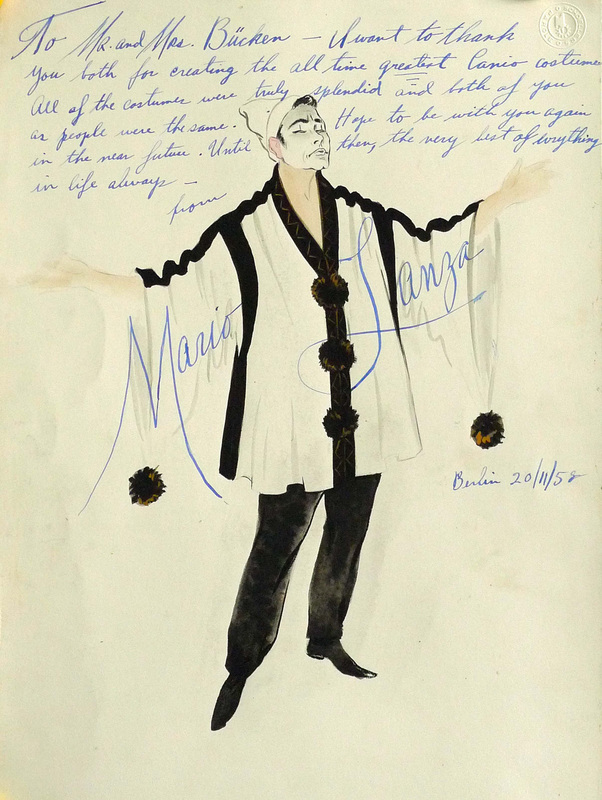 Costume design for the role of Canio singing "Vesti la giubba" from Pagliacci by Ruggero Leoncavallo with handwritten note from Mario Lanza to costume designers Mr. and Mrs. [Alfred and Sophie] Bücken. Click on the sketch at left for a larger view. 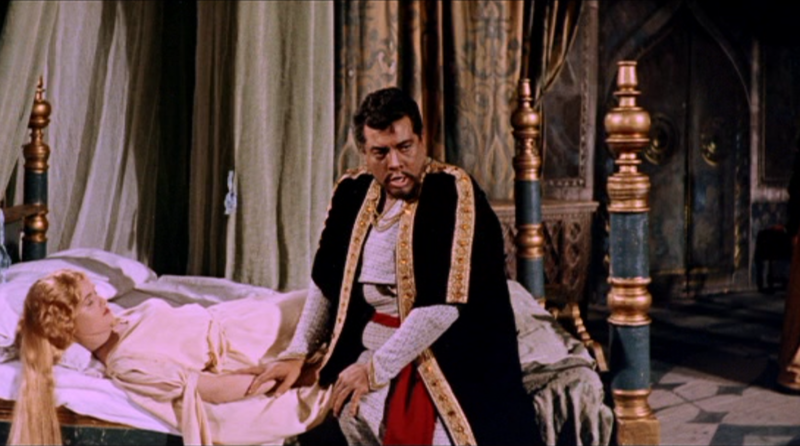 Screen shots and video clip (above, right) illustrate the costume as it appeared in the film. Click on the play arrow in the video clip and select Youtube to watch in crisper resolution. 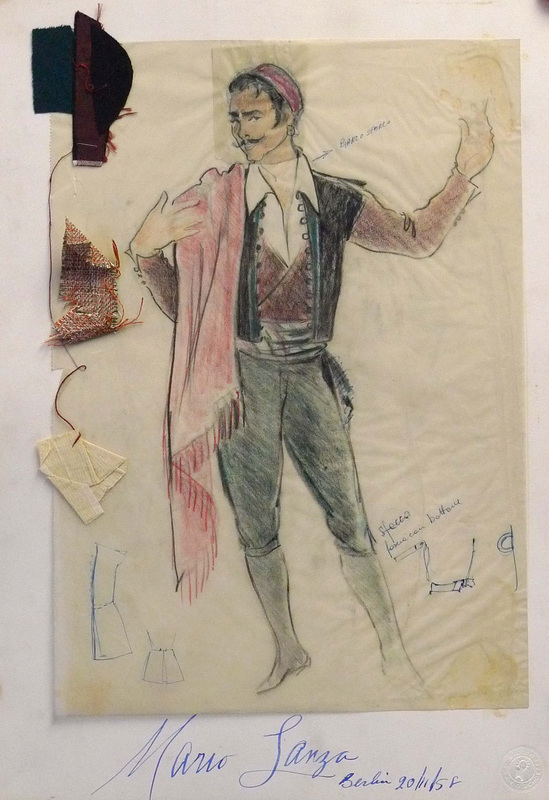 Costume design for the role of Ferrando singing "E voi ridete" from Così fan tutte by Wolfgang Amadeus Mozart with fabric samples, costume notations, and Mario Lanza signature. Click on the sketch at left for a larger view. 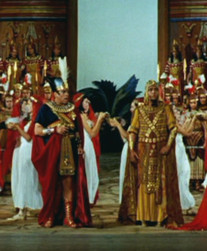 Screen shots (above, right) illustrate the costume as it appeared in the film. Click on the play arrow in the video clip and select Youtube to watch in crisper resolution. 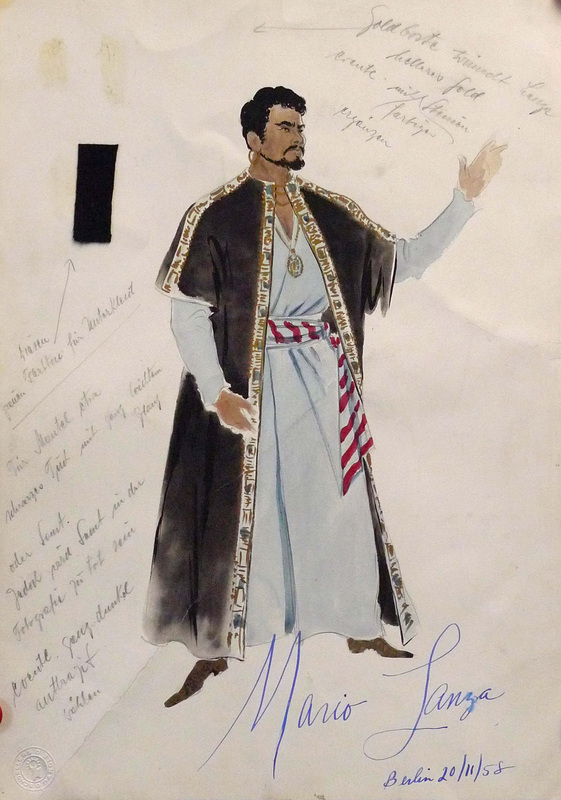 Costume design for the role of Otello singing "Niun Mi Tema" (death scene) from Otello by Giuseppe Verdi with fabric sample, notations in German, and Mario Lanza signature. German text. Goldborte wünscht Lanza helleres Gold. Eventuell mit farbigen Steinen ergänzen. 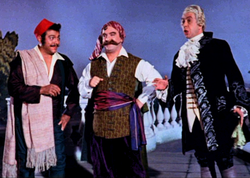 Hierzu grauen Farbton für Unterkleid. Für Mantel entweder schwarzes Tuch mit ganz leichtem Glanz oder Samt. Jedoch wird. Samt in der Fotografie zu tot sein. Eventuell ganz dunkles Anthrazit wählen. English translation. Lanza would like to have a lighter gold color for the gold edging. Maybe we should add some coloured gemstones. In addition (arrow points at the black fabric) a gray shade for the underdress. 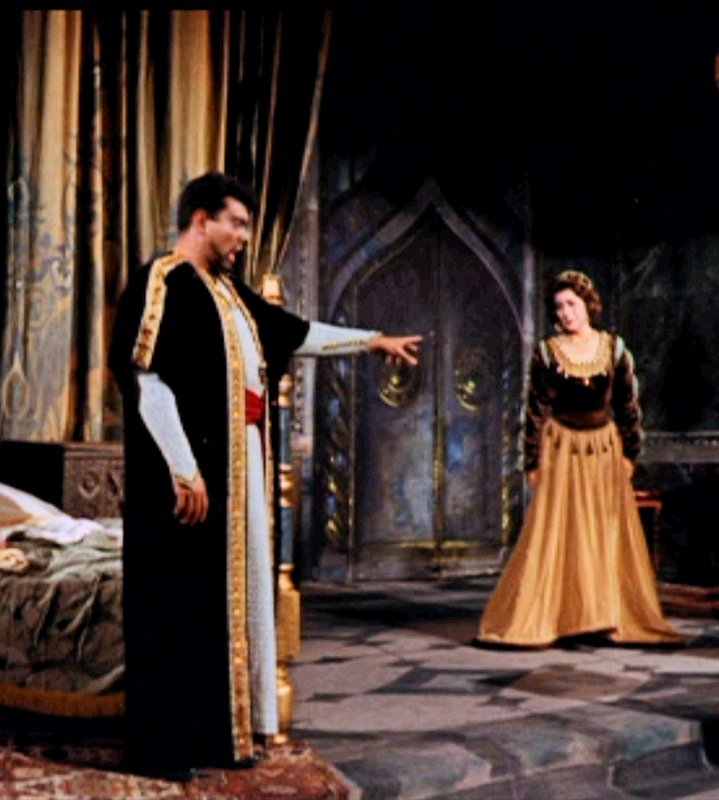 For the cape either a black fabric with very slight brilliance or a velvet fabric. But the velvet might appear lifeless in photographs. Maybe we should choose a very dark anthracite color. Click on sketch at left for larger view. 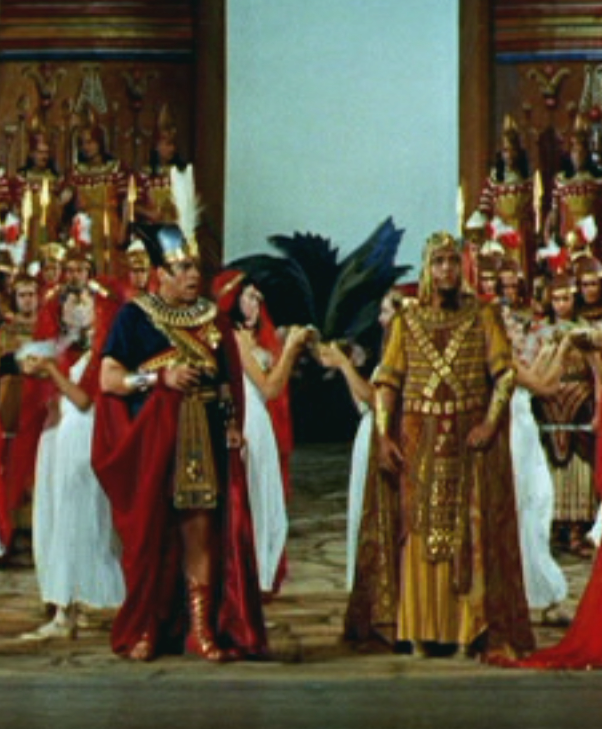 Screen shots and video clip (above, right) illustrate the costume as it appeared in the film. 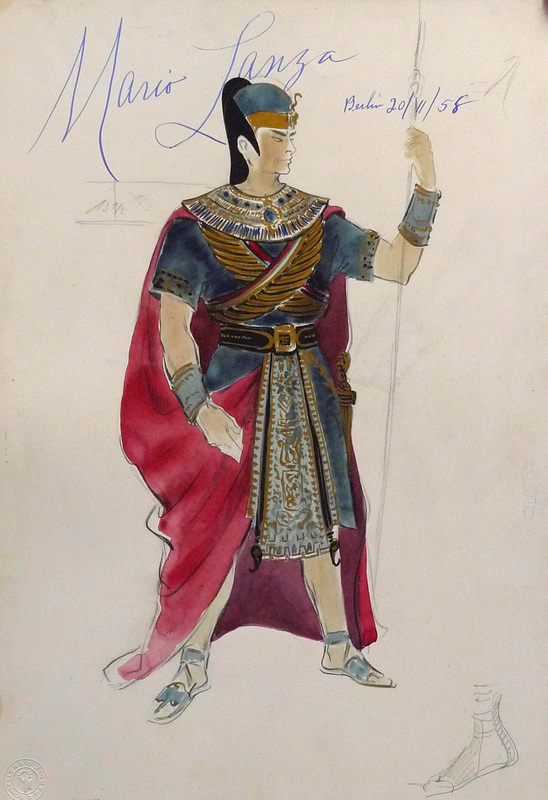 Costume design for the role of Radames singing "Gloria all'Egitto" (Grand March) from Aida by Giuseppe Verdi. 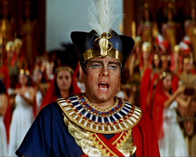 Lanza sang with the Rome Opera House Orchestra, chorus, and soloists including bass-baritone Gian Giacomo Guelfi as Amonasro. 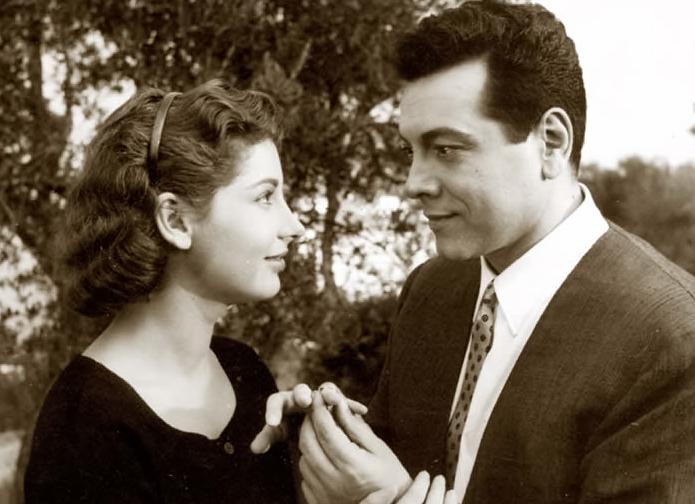 Image includes a sideview of footwear and Mario Lanza signature. Click on sketch at left for larger view. 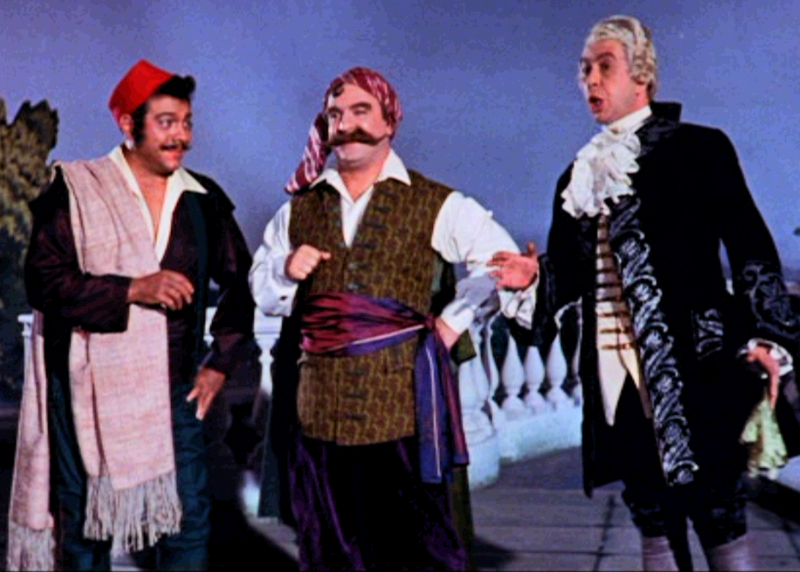 Screen shots and video clip (above, right) illustrate the costume as it appeared in the film. Click on the play arrow in the video clip and select Youtube to watch in crisper resolution.